Kalikiri Sainik School Teacher Posts 2018 / Asst Master Posts 2018 Recruitment Notification: Sainik School, Kalikiri, Andhra Pradesh, Under Sainik Schools Society, Ministry of Defence, Govt.of India has released Teacher Posts/Asst Masters 2018 recruitment notification. The SainiK School invites the applications in prescribed proforma from the eligible and interested candidates for filling up the TGT Maths, TGT Hindi Assistant Master, Art Master, Quarter Master (Band/Music Master Art master) posts in its School. Here, post details, Eligibility Criteria, Qualifications, Age limit, How to apply, Application Form, Application fee, and important dates details are provided here. 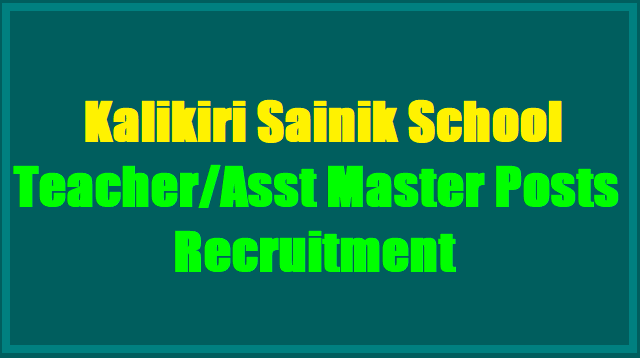 Sainik School, Kalikiri invites application for Asst Master vacancies. Qualification: Graduate with Drawing and Painting/Art/Fine Art with minimum two years full time diploma from a recognised institute or MA in Drawing and Painting/Fine Art from a recognised University or Higher Secondary/Intermediate/Senior Secondary Examination with minimum 5 years full time diploma in painting/fine arts from a recognised institute / University. Age: 18 to 35 years as on 01.04.2018. Age: 18 to 50 years as on 01.04.2018. Qualification: Graduate with Math subject. B.Ed. Qualified in CTET/ TET. Qualification: Graduate. B.Ed. Qualified in CTET/ TET. Selection Procedure: Based on written test, practical test and interview. How to apply: Filled in application form along with self attested copies of certificates are to be forwarded to The Principal, Sainik School Kalikiri, Chittoor Dist. Last date for receipt of applications: 03.05.2018. Qualification: Graduate with two subjects out of History, Political Science, Economics, Sociology and Geography. B.Ed. Qualified in CTET/ TET. Age: 18 to 35 years as on 21.10.2017. 4. Art Master (Contractual Post). i) Minimum Graduation from a recognised University with minimum High Second Div / Class in Telugu as Main subject. iii) Qualified in CTET conducted by CBSE. 2. Assistant Master (Contractual Post)- Hindi. i) Minimum Graduation from a recognised University with minimum High Second Div / Class in Hindi as Main subject and Sanskirit as one of the subjects. i) Minimum Graduation in English Literature from a recognised University with minimum High Second Div / Class. Graduate with Drawing and Painting/Art/Fine Art with minimum two years full time diploma from a recognised institute or MA in Drawing and Painting/Fine Art from a recognised University or Higher Secondary/Intermediate/Senior Secondary Examination with minimum 5 years full time diploma in painting/fine arts from a recognised institute / University. a. teaching Experience of 2 years in CBSE affiliated English Medium Schools, preferably residential. Consolidated Pay of Rs 20,000.00 per month. Desirable Qualifications for all posts. ii) Proven proficiency in Sports / Gaines at University / State level. iv) Proficiency in using Information and Communication Technology in teaching. v) Experience in organising /conducting co-curricular/extra-curricular activities in Residential Public Schools. vii) Posts will be a contractual post for one academic year at consolidated pay of Rs 18000.00 per month including free Messing for self with the Cadets in the Cadets' Mess during the academic session and rent free accommodation subject to availability. viii) Reservation and relaxation of age is applicable as per the existing Govt rules. ix) Applicants with higher qualifications and experience, proficiency in sports/games, NCC etc. will be given added credits during the short-listing process and selection process/interview. (a) Short listed candidates will only be called for selection process (Written test, Demonstration and Interview). (b) No TA/DA will be admissible for attending the selection process. (c) The post is reserved for ST Category only. In case, qualified reserved category candidates are not available, the vacancy will be filled amongst the general category candidates as per the Sainik Schools Society Rules and Regulations. (e) Indian Nationals only to apply. (f) The school administration reserves the right to cancel the vacancy due to administrative reasons. (a) Applicants are to clearly mention their e-mail id and mobile number in the application form to enable the school to communicate schedule of written test, demonstration and interview at short notice to the shortlisted candidates. (b) The post is All India Transferable and candidates should be willing to work in any of the Sainik Schools in India. (c) Shortlisted applicants are to bring their testimonials in original at the time of attending the selection test in support of their qualifications/experience as mentioned in the application failing which their candidature will not be entertained. (Andhra Pradesh) – 517 234. Eligible candidates may apply in the prescribed formats available at kalikiri sainikschool web portal. with one recent passport size photograph to the "Principal, Sainik School, Kalikiri (Post), Chittoor District, Andhra Pradesh, Pin:517 234 along with required Xerox copies of the Mark Sheets and testimonials, unstamped self addressed envelope and a Demand Draft for Rs.300/- for General and Rs.100/- SC/ST (all non-refundable) in favour of "Principal, Sainik School, Kalikiri" payable at SBI, Kalikiri (Code No 16427). Please superscribe the envelope with the name of post applied for.